Wine Maker (at Weingut Balthasar Ress in the Rheingau as well as at his own Weingut Wuertz Weinmann in Rheinhessen) and Wine Blogger Dirk Wuertz had put together an interesting list of guests and wines to brainstorm about the question: Quo vadis Rheingau? The Rheingau – with its rich history and many wine estates with a world wide reputation - is by many perceived as a wine region that is falling behind from a position where it was leading German wine. Dirk Wuertz opened the afternoon with a “12dry” by Josi Leitz, “an extremely successful wine from the Rheingau sold in the whole world” as he said. The other very popular wine, I mentioned, was Dr. L from Ernst Loosen, a medium-dry wine from the Mosel. Furthermore, the most popular German wine in New York is Gunderloch’s Jean Baptiste, also a medium dry wine for about US$ 15. Joachim Kaiser had prepared a little “discussion paper” to get the discussion starting. He stated that outside of Germany, German wine was perceived as a sweet wine. Indeed many people outside of Germany equate wine from Germany wine (fruity sweet) wine from the Mosel. He demanded that the Rheingau holds against that and suggested to promote a particularly dry image in the Rheingau. He also stated: What Bordeaux is for red wine in France, the Rheingau should become for white wine in Germany. 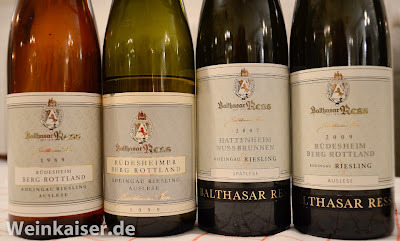 One thing that was also missing in his view was a lead winemaker, an icon, and a leading Rheingau wine, as Rheinhessen has it with Klaus Peter Keller and his G-Max, which sells at a 3 digit price. Then, we had a discussion. Here are some important points. Hellmuth Knall argued that a number of things have gone wrong in the Rheingau. Why does the Rheingau call their absolutely finest dry wines Erstes Geweachs and not Grosses Gewaechs as everybody else does in Germany? Why is a Erstes Gewaechs wine not really dry? Generally, he felt dry Rheingau wines tend to have a sweet finish that he does not really like. As for the lead figure, this was of course Bernhard Breuer until he passed away. Ralf Kaiser (Weinkaiser) contended that when he worked as a wine store people would come in and ask for a dry wine but then choose an off-dry dry wine. I reported from the US, where at the monthly tasting of the German wine society there is an overwhelming majority for fruity sweet wines. Middle Mosel Kabinett wines with say 15 gram sugar are the favorites. Dirk Wuertz argued that might be true for the German wine society but the New York trendy wine bars you will not find fruity weet wines. Dry wines sell very well there. Then, the wine makers entered the discussion. Christian Ress saw 2 trends. One trend was to the classic grape varieties. That favors Riesling producers and in particular the Rheingau. Second, he saw a trend to cool climate wines with low alcohol. That also spielt ihm in die Haende. 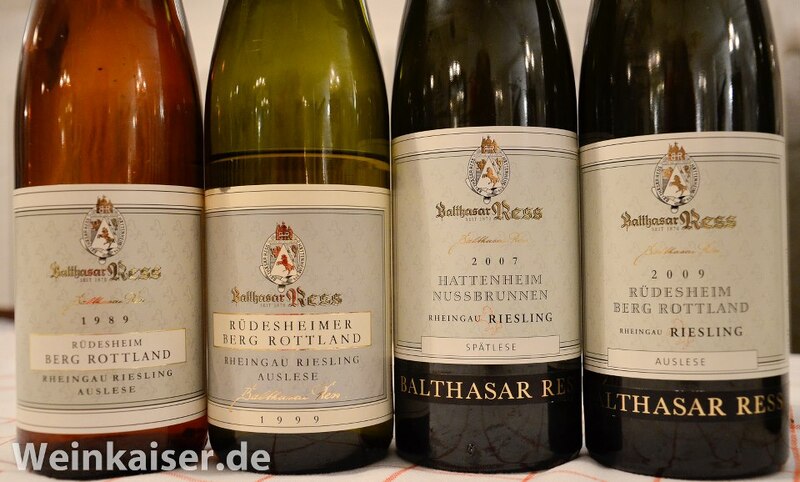 Weingut Balthasar Ress exports more than half of its production. We were honored by the presence of a group of sommeliers from the Maldives, where Ress is becoming active. Desiree Eser argued that her situation was very different. She exports almost nothing. 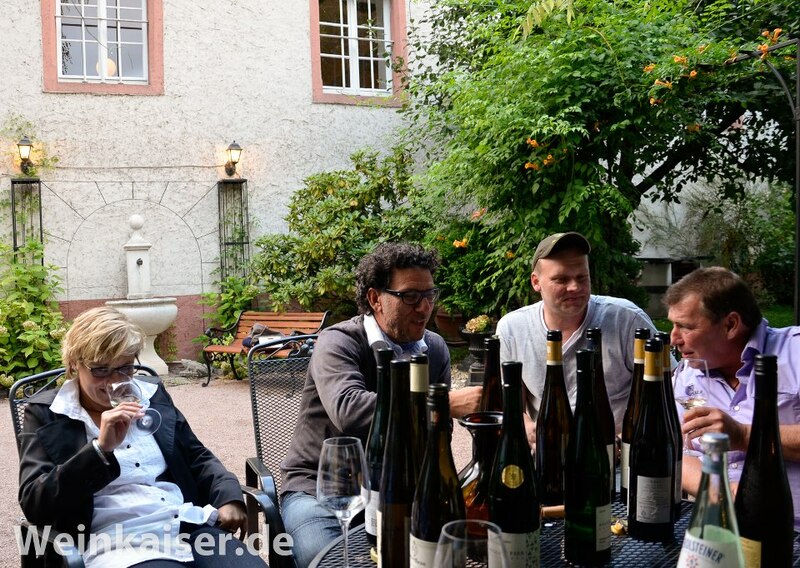 She sells all the wines to direct clients of the Weingut August Eser. They all want dry wines and she therefore makes her wines in a dry style. "But not bone-dry, as Riesling benefits from that little hint of sweertness" she concluded. Kristine Baeder, editor in chief of the Sommelier Magazine, made an interesting point at the end of the discussion. Rheinhessen has seen an amazing emergence of young, dynamic winemakers. But Rheinhessen did not have the reputation the Rheingau has and consumers never had any expectations. That gave the yong winemakers of Rheinhessen all the freedom of the world to experiment and come up with whatever they wanted to come up with. 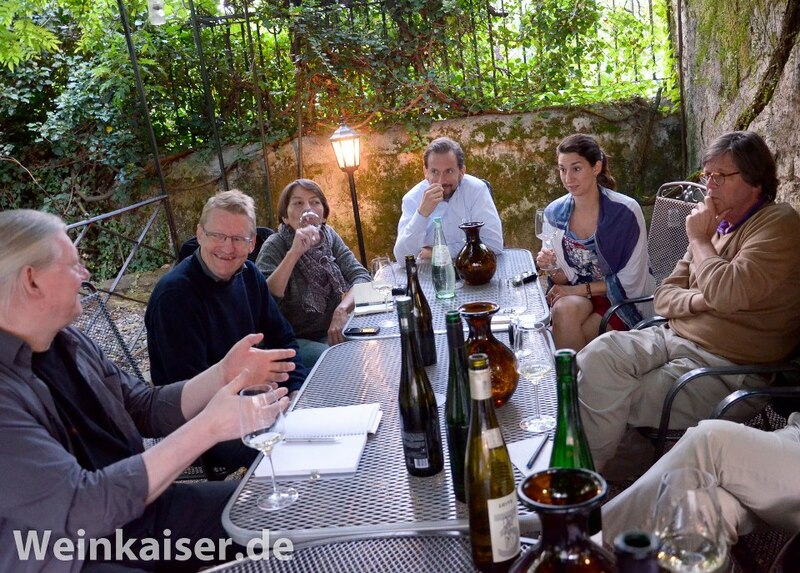 The young generation of Rheingau winemakers is much more operating within tight historical constraints. After the formal part of the discussion, we proceeded to the table and ate eat dinner. Dirk was in charge of the barbecue. We had more wonderful wines and discussion over dinner, in a much larger group, as we were joint by Stefan Ress and another group of people Stefan Ress brought along, as well as a group of sommeliers from the Maldives.